A week of fun homecoming activities promoting Lynnville-Sully Hawk pride united all students, staff, and the community Sept. 25-29. The high school student council planned dress-up days and a variety of other activities throughout the week, including powder puff volleyball, powder puff football, a cake bake, float, window, and sidewalk decor competitions, and a dodgeball tournament. Middle school students got in on the homecoming fun with their own dress-up days planned by the middle school student council. On Thursday night, the community gathered at the high school gym for coronation where classroom skits were shared, L-S cheers rang loud and proud, and seniors Christine Nikkel and Brevin Hansen were crowned homecoming royalty. 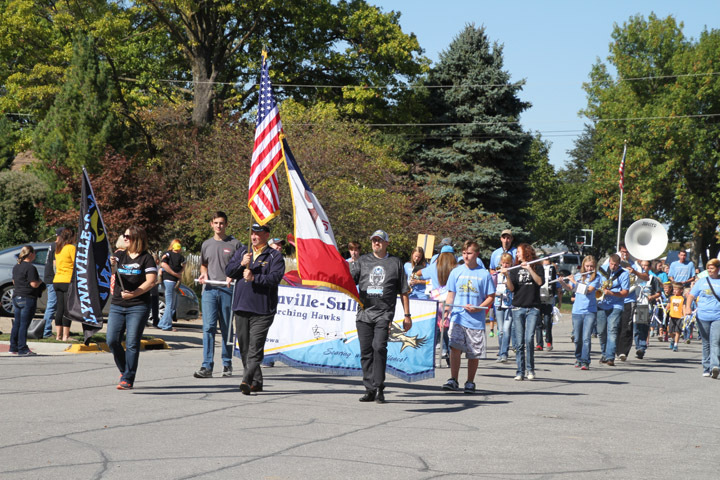 Friday featured perfect weather for the parade which featured all K-12 students parading around the Sully square. A pep rally promoting Hawk pride was held after the parade and was led by high school football cheerleaders and the high school band. Prior to the big Friday night football game, the Lynnville-Sully Community Education Foundation hosted a chili soup and cinnamon roll supper. Brenna Lanser was the lucky L-S alum in attendance to win the $100 gift card. The Hawks faced the Pekin Panthers in a showdown of undefeated teams. The ninth-ranked Hawks took down the sixth-ranked Panthers, 35-7, in front of a large crowd of Hawk supporters.